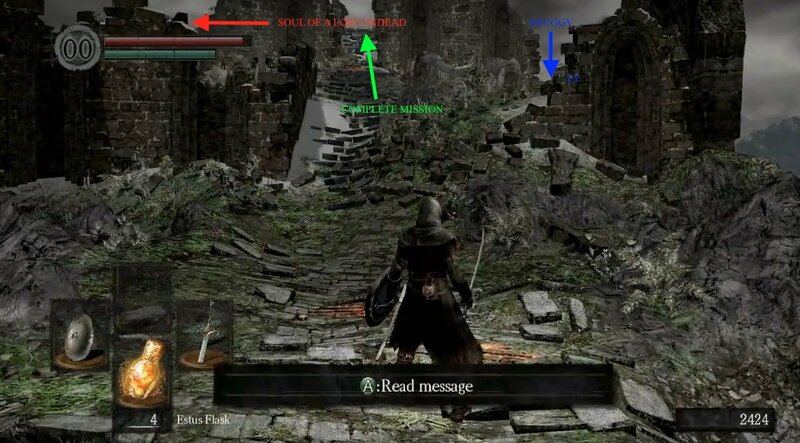 The Northern Undead Asylum is the starting area of Dark Souls and Dark Souls Remastered. 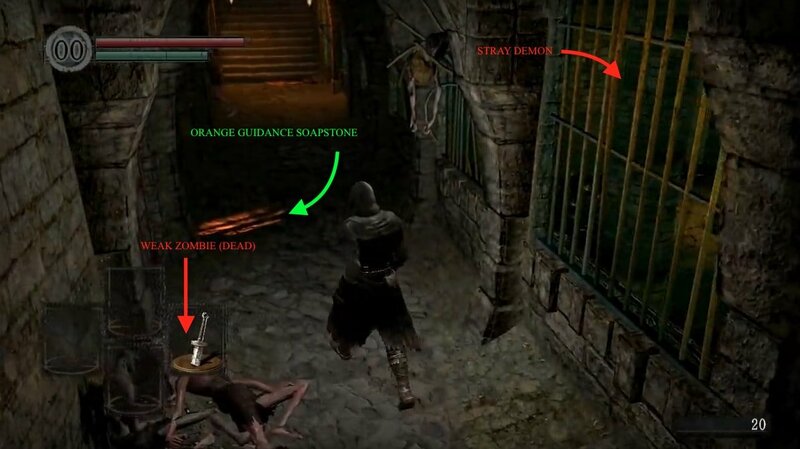 Your character will be locked in a prison and will find its way out whilst reading helpful Orange Guidance Soapstone messages that teach you about the controls of the game. Starting Hallway - When you gain control of your character, investigate the newly-dumped corpse beside you to attain the Dungeon Cell Key. This key unlocks the cell door and allows you to proceed out. This leads you into a hallway with Orange Guidance Soapstones (messages left by the developers in order to teach you the basic controls and manoeuvres you can perform with your character, you can also use them as a guide as they trail to the next objective, in this level) and two unarmed Hollows, who you can practice your newly-acquired moves on. They will not fight back so don't be afraid to try everything out on them, and get used to the game's mechanics and battle system. As you proceed down the hallway, on your right you will get a glimpse of the Stray Demon, an optional boss who you may face upon returning to the Northern Undead Asylum. Go through the hallway, and up the stairs. Courtyard - At the end of the hallway you will come to a waterlogged room with a path on the right leading to a ladder. Take the ladder up, proceed out of the room into the open courtyard, and interact with the bonfire in the middle of the yard. Bonfires act as the checkpoints of this game. If you die, you will respawn at the last bonfire you rested at. You may also perform a plethora of other extremely useful actions at bonfires, but for now you may only rest at them (which replenishes your HP, spell uses, and cures you of any negative status ailments except for Curse). 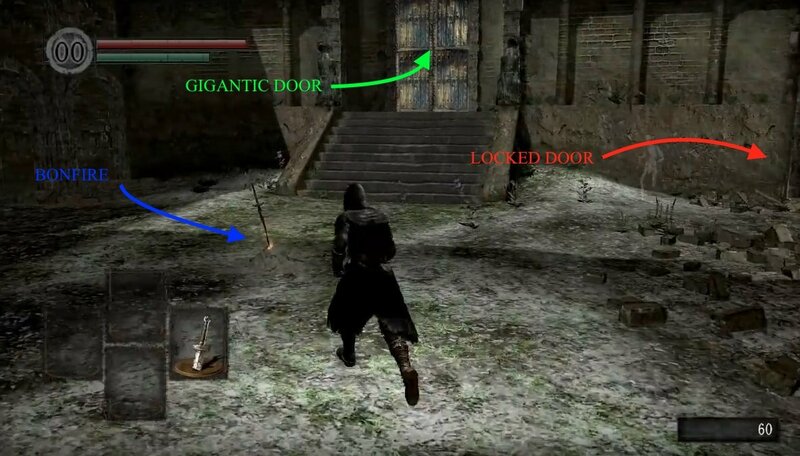 Big Boss First Encounter - If you explore the courtyard, you will find a gigantic door directly ahead of the bonfire and a door on the right side of the area (if facing the gigantic door) which is locked from the opposite side. Keep this door in mind for a little later. When you are ready, open the gigantic door. The Asylum Demon will fall in and engage you. Here you have two options: you may choose to run towards the closed door directly ahead of you and fight the Asylum Demon with just your Straight Sword Hilt or bare fists, or you may run to the stairwell on the left side of the room. 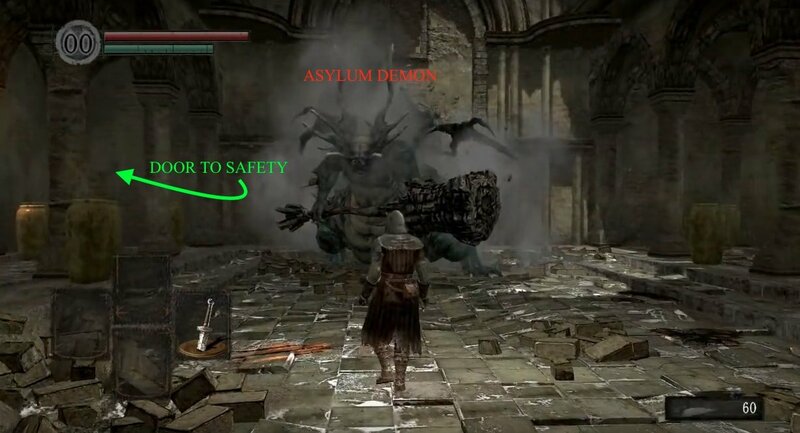 Note that if you choose to fight the Asylum Demon at this point, then you can prepare yourself for a long and tedious battle by clicking on it's name for in-depth information about him. Upon his defeat he will give you his Demon's Great Hammer and a consumable Humanity item. 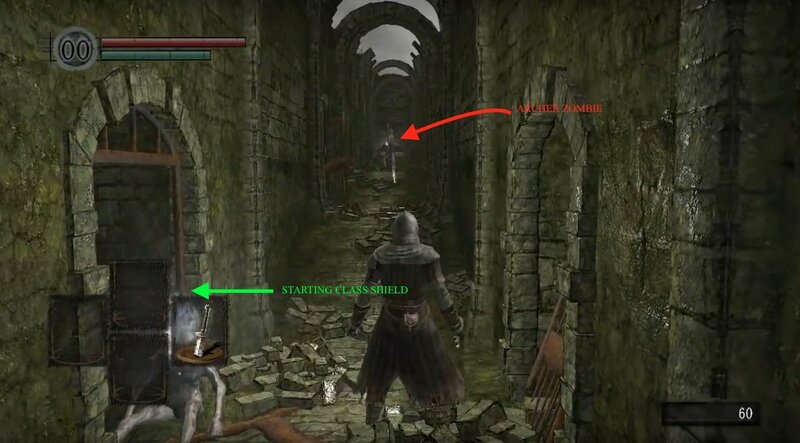 Acquiring Starting Weapons - If you choose not to fight, make a dash to the far end of the left side of the room (as seen above) to find a stairway. Once you enter the stairway a spiked gate will close behind you, leaving you safe to fight the Asylum Demon another day. At the bottom of the stairs you will find another bonfire. Rest here if you feel the need, then follow the path and turn left to proceed into the long hallway. At the far end of this hallway is an aggro Zombie armed with a bow and a thirst for your blood. You can take cover in the first open cell on your left, where you will also find a starting class shield. Here will find another Orange Guidance Soapstone message informing you of how to equip armaments. 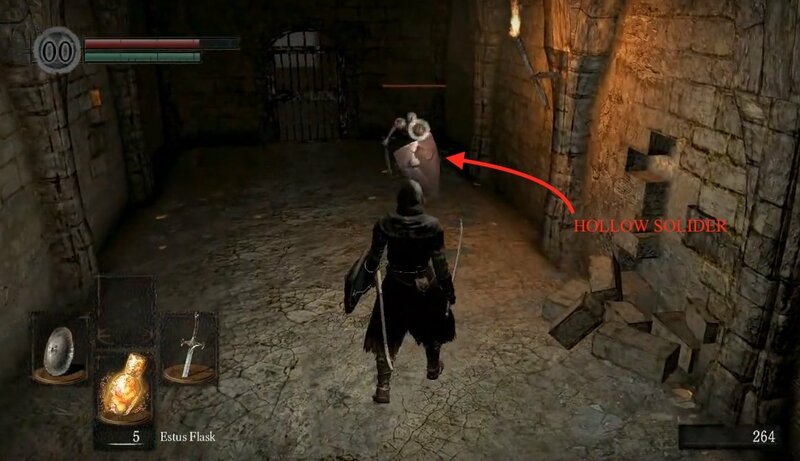 Unlocking Locked Door - Run towards the Hollow with your shield up in order to block his arrows, and then pick up your starting class' weapon from the body laying on the ground near the Hollow. Kill the Hollow and proceed up the stairs on the left, towards your first fog gate. A fog gate represents either a change in the area or a boss fight beyond the fog gate. This time it merely represents the fact that you are entering the second floor of the Northern Undead Asylum. If you turn to the left you will be overlooking the first bonfire of the game, as well as the door to the Asylum Demon. You will also notice two paths: one leading to you left, and one leading to your right. The path to your left also has an item on a level higher than what you are currently on, and is otherwise a dead end. The path to your right has a set of stairs going up and down. For now, take the stairs going down. At the bottom of the stairs, you will notice the door from earlier, which was locked from the opposite side. 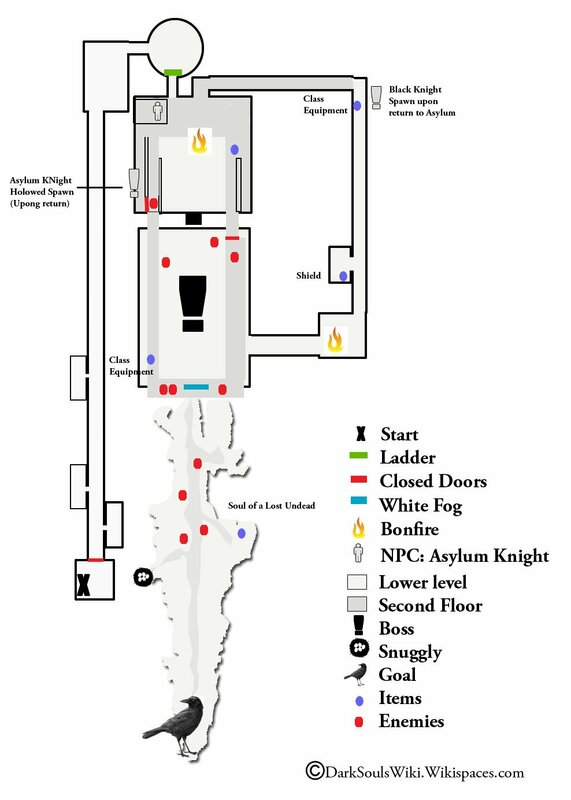 You may undo the latch and open the door, opening a short-cut to the upper level from the first bonfire. When you are ready, head back up the stairs to the second level. Evading the Trap - Before you take the stairs leading upwards to the third level, note that there is a trap at the top of the stairs. Once you start heading up the stairs, a Hollow will push a huge boulder down the stairs which will run you over if you do not roll to the right and out of the way. You should hear an auditory cue to tell you when the boulder has been pushed, but unless you are listening for it and are prepared for a trap, you will most likely going to get hit. On your left you should see an arched, spiked fence. The boulder is typically triggered when you have gone past half of it. So you should time your roll to the right around then. Once the boulder has gone by, investigate the hole which it created in the wall opposite the two sets of stairs. Don't worry about the Hollow who pushed it down because he will not chase you. Third Floor Access - In this previously-enclosed room directly behind you, you will find the Elite Knight NPC who helped release you from your cell during the opening sequence of the game. 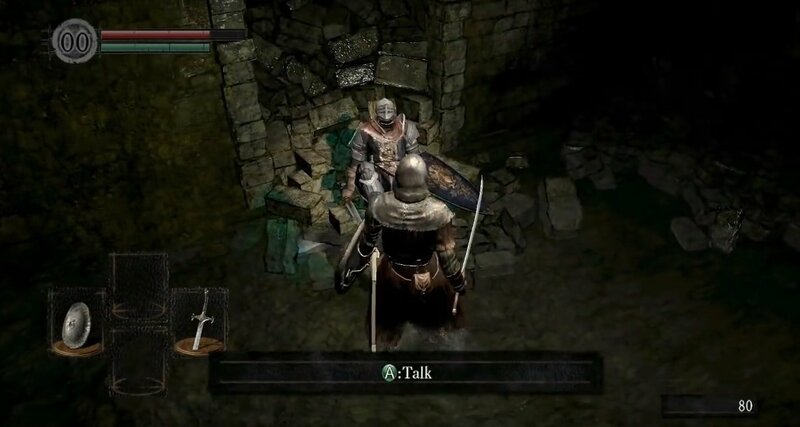 He is dying here, and with his final breaths he gives you five Estus Flasks, the Undead Asylum F2 East Key, and if you beat the Asylum Demon at the initial encounter before getting your starting class' gear you'll get the Big Pilgrim's Key. Now you may safely proceed up the previously booby trapped stairs to the third level where you can use your newly-acquired Undead Asylum F2 East Key to open the gate to the balcony area. The View - If you have chosen a starting class which uses magic then you will find your starting class' Catalyst on the right side immediately after you exit the hallway. 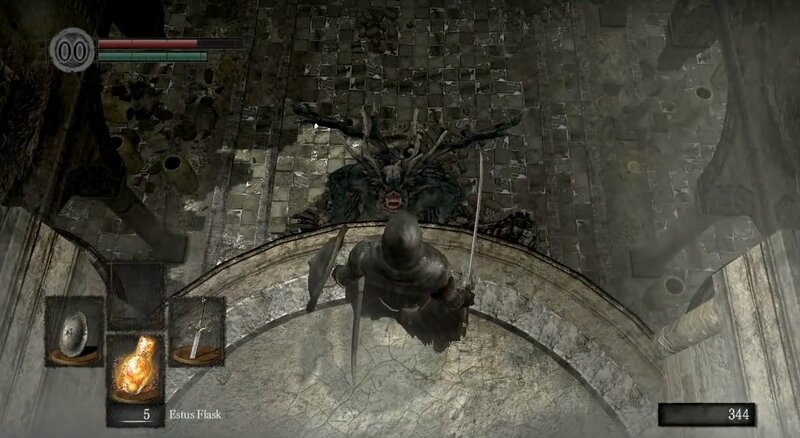 On the balcony itself you will encounter three more Hollows, but this time two will be armed with Broken Straight Swords while the third will harass you with a bow and arrow. They are not much more of a threat than they were when they were unarmed. Dispatch them, and then enjoy the Gorgeous View of the background. Note that you can also see Snuggly from here (the bird's nest on the lone perch on the right side of the cliff). Know your Surroundings - If you have not already defeated the Asylum Demon then you will also find a massive fog gate up the small set of stairs where the archer was stationed. Ignore this for now, and enter the door to the right. At the opposite end of this room, you will find an Undead Soldier (Sword). These foes are equipped with a Longsword, and Hollow Soldier Shield, and the Hollow Soldier armor set. They can deal a large amount of damage to characters with light/medium armor, and their move set is hard to parry at first because of their unusually slow attack animations. Do not take these enemies lightly until you have learned their moves, as they can punish you for underestimating them. Behind the Undead Soldier (Sword) is a locked door. Keep this in mind for your return to the Northern Undead Asylum. Once you have finished off your first real enemy, be sure to heal up using your Estus Flasks, if you've taken any damage. When you are ready, enter the fog gate. Demon Slayer - (If you have already killed the Asylum Demon during the initial encounter with it then the fog gate will not be there and you will just have to drop down from the ledge and open the door that the Asylum Demon was guarding with the Big Pilgrim's Key which you will have received from the Elite Knight.) You will quickly notice that you are on a ledge above the door which the Asylum Demon is guarding, and that the Asylum Demon is directly below you. That being said, your position will not stop the boss monster from jumping up and smashing you with his Demon's Great Hammer, so be hasty. As the Orange Guidance Soapstone message at the foot of the steps leading up the fog gate is hinting at, immediately walk or run off the edge and hit the Asylum Demon with a plunging attack, taking away much of his HP. Then prepare to fight him for real, with your starting class' gear. Ending - Once you dispatch the Asylum Demon, he will give you 2,000 Souls, the Big Pilgrim's Key and a consumable Humanity item. Use the Big Pilgrim's Key to open the door it was guarding to exit the building. Make your way up the cliff, and after you scale the first steep incline you will come to a relatively (in comparison) flat stretch with three gravestones to your right. If you take the path to your right you will come to a bird's nest containing Snuggly. For the moment you can only trade one thing with Snuggly, and it's not a very good trade. Make a note of Snuggly's location for future reference and then move on. If you take the path to your left and follow the winding path as it goes downhill you will discover a Soul Of A Lost Undead on a corpse. Once you are finished up with the area, head up to the top of the cliff to the giant crow's nest to initiate a mandatory cut-scene. Oscar of Astora rescues you from captivity (by giving you the Dungeon Cell Key in the opening sequence) and later gives you five Estus Flasks and the Undead Asylum F2 East Key before dying. What is that item on the destroyed staircase leading from the undead knight? when would i need to come back?